Millipedes are common occasional pests that sometimes invade buildings, particularly when the weather turns hot and dry. While millipedes sometimes enter in large numbers, they do not bite, sting, or transmit diseases, nor do they infest food, clothing or dry, structurally sound wood. Millipedes vary in both color and size. The most common species that invades buildings is the "garden millipede," which is brownish-black in color and about one inch long. Although millipedes are often called "thousandleggers," they actually have far fewer legs, but each body segment has two pairs of very short legs. When disturbed, millipedes often curl up into a "C" shape and remain motionless. They crawl slowly and protect themselves by secreting cyanide-like compound that has an unpleasant odor. Some people confuse millipedes with centipedes, which look somewhat similar. Centipedes have only one pair of legs per body segment and the legs are usually longer than those on millipedes. Centipedes also tend to move about more quickly than millipedes. The most effective, long-term measure for reducing entry of millipedes (and many other pests) is to reduce excess moisture and hiding places, especially near the foundation. Remove leaves, grass clippings, heavy accumulations of mulch, wooden boards, stones, boxes, and similar items laying on the ground beside the foundation. This does not mean you can't have mulch around the foundation; simply keep it 6-12 inches away from the wall. Use inorganic mulches such as gravel which will drain better. Prevent water from accumulating near the foundation, in basement walls or in the crawl space. Keep gutters and down spouts free of debris and use either splash guards or perforated pipe to reduce puddling. Homes with poor drainage may need to have foundation drains installed, or the surrounding ground contoured or sloped to redirect surface water away from the foundation. Seal cracks and openings in the outside foundation wall, and around the sills of doors and basement windows. Install door sweeps on all exterior entry doors, and apply caulk along the bottom outside edge and sides of door thresholds. Seal expansion joints where outdoor patios, sunrooms and sidewalks abut the foundation. Expansion joints and gaps should also be sealed along the bottom of basement walls on the interior to reduce entry of pests and moisture from outdoors. 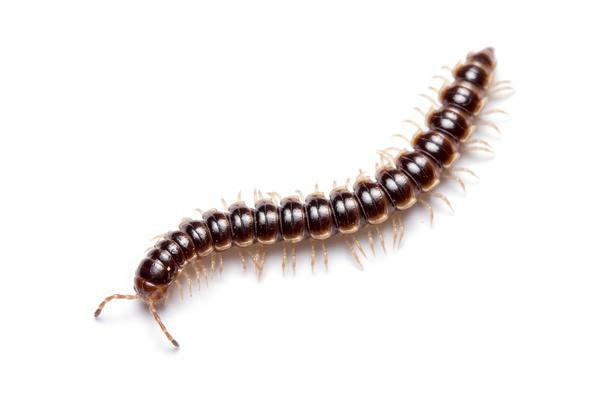 Application of insecticides along baseboards and other interior living areas of the home do not really stop millipede invasions. Once indoors, millipedes end up in kitchens, living rooms, etc. and soon die from a lack of moisture. Remove them with a vacuum cleaner or broom. Applications of insecticide outdoors may help to reduce inward invasion of these and other pests. Treat along entryways, around crawl space doors, foundation vents and utility openings, and up underneath siding. Insecticides applied along the interior foundation walls of damp crawl spaces and unfinished basements may help temporarily. However, correcting such moisture problem is far more important in preventing millipede and other problems. Dust formulations may work well in some areas, but they should only be used in areas where children and pets will not come into contact with the chemical. Perimeter sprays may also help but are rarely 100% effective in stopping the millipedes. The key to successful chemical control is spray volume, i.e., that amount of diluted chemical that you apply over an area. The spray must penetrate the soil, not simply lightly coat the surface. The best means of application for homeowners is a garden hose attachment. Treat a 2-5 foot wide area of ground along the foundation in mulched, ornamental plant beds and grassy areas, as well as an 18-24 inch wide vertical band of the foundation wall. Spraying higher up on the house, such as treating soffits, overhangs, around windows, etc., may help; however, you need to watch but for chemical drifting down on to you. chlorpyrifos* (Dursban) 2 E, Pro See label For use on golf courses; check new label. 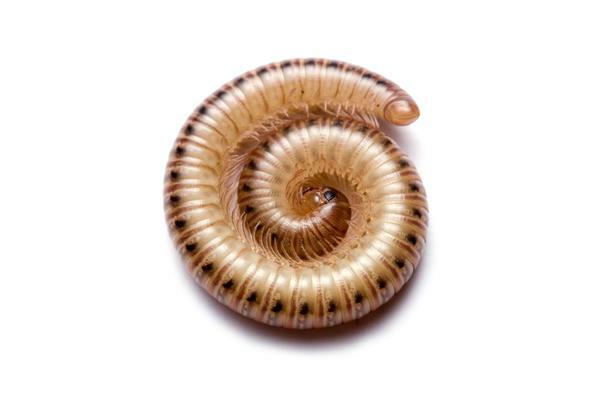 Controlling Millipedes in and Around Homes Household Pests. Waldvogel, M. 2005. NC State Extension Publication. Secretion of Benzaldehyde and Hydrogen Cyanide by the Millipede Pachydesmus crassicutis (Wood). Blum, M.S. and J. P. Woodring. 1962. Science Vol. 138 no. 3539: pp. 512-513.